Dreaming about buying a place in the sun or on the ski slopes, but not sure you can afford it? Maybe you can with a leaseback property! If you want to buy a property in excellent condition, a new property or a property off-plan (ie: before it has been built) and you'd be happy renting it out - then read on. 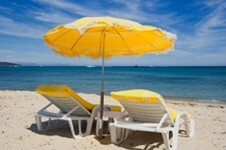 You'll get the benefit of luxury holidays in your own property for very little cost. Leaseback properties or "Résidence de Tourisme" were introduced by the French Government in 1976. These leaseback developments were built in certain areas of France to improve employment and boost tourism in those areas, by providing rental homes for French tourists as well as those from abroad. New ones are being built all the time, with more than 1000 existing today. You can find these developments throughout France, primarily along the Mediterranean and Atlantic coasts, and in the Alps. In other words, in good locations where people will want to rent them. The property will be in an extremely good state of repair, brand new or not yet even built. The property will, more often than not, be furnished, saving you the bother of having to furnish it yourself. The managing and maintenance of the property will be dealt with by someone else, ie: the developer or management company concerned. So all utility and upkeep bills will be paid by them, less hassle for you. You'll receive a good rental income from the property, which is guaranteed for at least nine years. If it is a new build, your purchase price will be less than that advertised, as you can claim tax back from the French government (this works out to be approximately 16% off the purchase price). You can put down as little as 5% deposit on a property (though most deposits are 20%). If you'll need to take out a mortgage to buy the property, it may be partly or completely covered by the rental income you receive. You need not have security worries as your property will be occupied for most of the time. How does a leaseback property work? You buy leaseback properties on the condition that once you have purchased the property, you then lease it back to the developer (usually if the property is brand new or bought off-plan) or letting agent. But you, the purchaser, are the owner of the property, you own the freehold. (This is very different from timeshare properties, where this is not the case.) This lease must be for a minimum of nine years, during which time you agree a set number of weeks a year when you can use the property yourself, free of charge. The developer or letting agent then rents your property out for you, while you are not using it, guaranteeing you a fixed rental income. This is usually between two and six percent of the purchase price. After the nine years, or however long you have agreed, you then renew your rental agreement with the developer or letting agent, or end it. If you choose to end it, the property is then yours to do whatever you like with, to live in, to keep as a holiday home or to sell. Remember though, that any outstanding mortgage will still be outstanding. It is also worth bearing in mind that you can sell your property at time, though costs may be incurred depending on when this is. Leaseback properties are all of excellent standard. They are often brand new or still in the planning stages. If not new, however, they will have been well-maintained over the years, and be in very good if not perfect condition. Often they have facilities on-site, such as gyms, swimming pools, gardens, tennis courts and wardens, all of which help the agents or developers to rent the property out. You are only allowed to use the property yourself for usually between four and six weeks in any year, though this does vary with each leaseback development. These weeks must be booked with the developer or letting agent at the beginning of the year or at an agreed time. Sometimes, you may have to use alternative similar properties during your booked weeks. At the end of your rental agreement, the developer or letting agent has certain rights. The right to renew the contract between you, or, if you didn't want to do this, the right for compensation from you. You will be taxed on your rental earnings, the level of tax depending on how much you are earning in rent. If you sell within twenty years, you will have to pay the tax discount back to the French government, if the property is no longer being managed as a leasehold property. If it will continue to be a leasehold property and just have a new owner, you no longer have to pay this tax back. If you sell within sixteen years and the property has gone up in value, you may also have to pay Capital Gains Tax. The Taxe Foncière (equivalent to local rates) must be paid for by yourself, though if the property is new, this is waived for the first two years. If your property has facilities on-site, these may not be open or useable during the low season. So if you think a leaseback property is for you, you'll need to think about financing the property. If you have the cash and can pay outright for a property, it would seem you can only be in a win-win situation. You can have a lovely place in the sun or in a ski resort which you can call home for a few weeks of the year, with minimal fuss, which will also give you a rental income. However, if you need to borrow money in order to purchase your leasehold property, as the majority of people need to do, you needn't worry as mortgage companies are there to help. Although you need only pay a deposit of 5% of your property purchase price with some mortgages, is this the most beneficial mortgage for you? Maybe it would be better to pay a higher deposit, and so decrease your repayment? You need to keep your monthly repayments low, so are looking at a long term mortgage of 25 years. You may like to repay your mortgage in the next few years, so want a mortgage where there is no penalty if you should do this. One of the problems with leasebacks is getting good advice. They're very specialised - so not many advisors (in the UK or elsewhere outside France) know that they even exist. To get good advice, you really need to talk to the right person. We can provide answers to most of the questions you're likely to have. Just fill in the following form and your details will be passed to an expert who will personally consider your situation and provide you with a range of options. Hello - is it possible to sell a leaseback? Mine has been for sale for six years and not had any luck, what's the penalties for selling before the contract is complete? Many thanks. Thanks for contacting us. As we say in our article, it is possible to sell a leaseback property at any time. If you sell before the contract is complete, the penalties differ with different contracts, so I'm afraid you will have to see what you signed to see what compensation you may have to pay. I understand you would also have to sell it on as a leasehold, so with a lease still in place for the new owner. Should you have a mortgage, bear in mind early repayment fees. Capital Gains Tax may also be due. Leaseback property does not necessarily increase in price in same way as non leaseback property. There is no definitive model as all leaseback plans are different, but there are important factors affecting the resale price. 1. The development company invests a large amount in selling the plans, sales are accented towards a new unit with new furniture and is simpler for a customer to finance. This does not necessarily reflect the true resale price of another unit. An individual has to compete with a strong marketing service selling new properties and will not achieve the same price. 2. The TVA advantage is reduced, an existing owner has to repay and the amount then transferred to the new owner is smaller in proportion and loses the benefit of the tax gained. 3. The guaranteed income period is reduced, yet the income is still fixed at the original purchase price, so if the original return was 5%, and the property was sold after three years at a 25% increase, then the return will now be under 4% for the new buyer. My opinion is that a leaseback is a term investment giving a guaranteed income and will not usually show any capital gain. It needs to be kept for a minimum term of ten and preferably twenty years (if the management company wishes to renew the lease) and is similar to a bond, giving guaranteed income and your original investment back. I never recommend leasebacks for a capital gain.